Hello there crafty friends – I hope you are well and enjoying the weekend. I haven’t done any crafting this week apart from this very quick card here. It had to be a quick one as I have been struggling a bit this week with a bad back. Not so bad that I’ve been laid up in bed or anything – thankfully, so I should count my blessings really! You know how I did it? Getting out of my car!! I was popping a card round to my friends house and had parked on a slopey grass verge. I stepped out and actually said OUT LOUD to myself “ooh, that was further down than I thought” and have been hobbling around ever since! Just shows how sometimes doing the simplest things can cause a lot of pain! Anyway, I’m dosing myself up with painkillers. I need to be a bit better at least for our trip to Legoland! The kids have been wanting to go for a while, so seeing as Dave and I are both off work again next week we thought we’d travel down tomorrow – stay in a hotel then we’ll have the full day there on Monday. So we have 2 very excited kids here – 3 if you count my husband! So, getting back to this card (!). My Mum asked me to make a card for my cousin’s son who I think is in his late teens. Yet again I reached for a nautical themed paper – always a good bet for male cards I think. I’ve used this collection before for a post, it’s called ‘Sail Away’ by First Edition Paper. 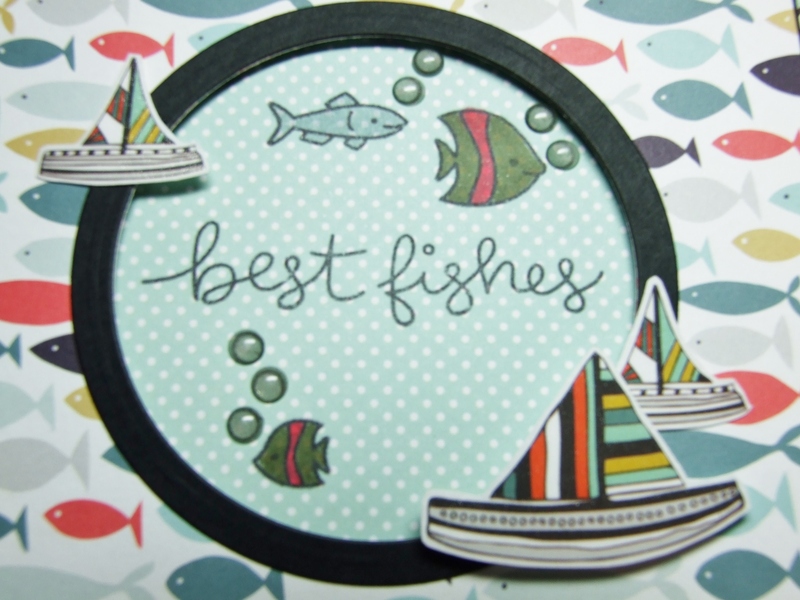 This time I used a Lawn Fawn stamp set – ‘Fintastic Friends’ for the greeting and fishes in the circle. Although I stamped the bubbles I put some Dew Drops by Papermania on top of them. 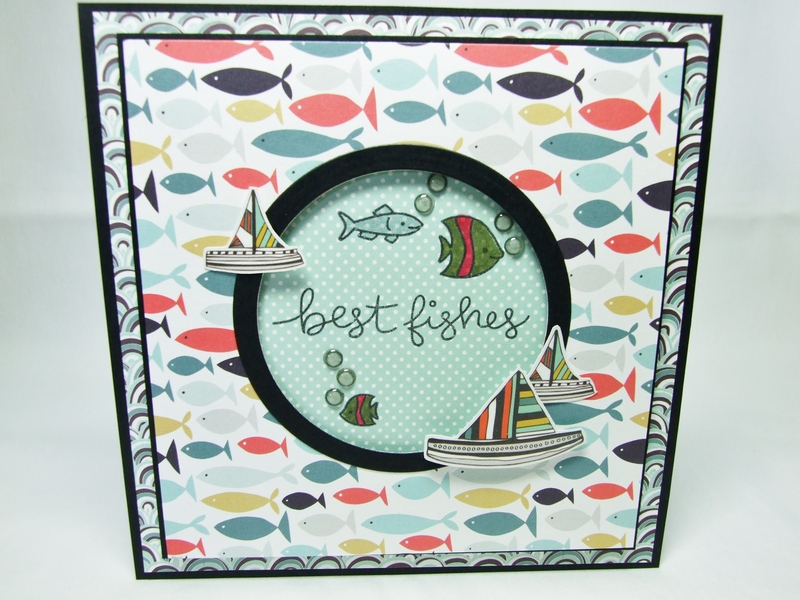 I also used Spellbinders circle dies to create the aperture and frame. Hi Maria, thanks for stopping by and for your kind words 🙂 I’m sure we will have a great time at Legoland thankyou – I’ll just have to make sure I have plenty of muscle rub on my back!! Aww thanks! I might do that – you never know your luck! Oh no! I sure hope you’re doing much better today, Karen!! Your card is fantastic! 🙂 Super cute papers and stamps! Love it! hugs!! 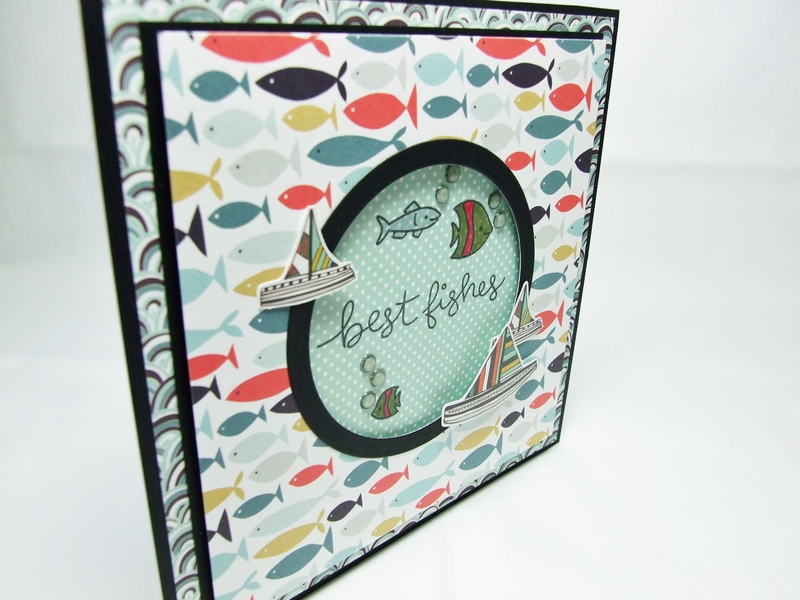 Fabulous nautical card! Love the papers and great design!